Amira Patton-Johns (left) and Becky Howell (right) at work at Camden Printworks on March 19. The business is printing T-shirts again after being robbed recently. Owner Adam Woods vows to stay. A man hired last summer to do occasional odd jobs at the Camden Printworks was arrested Tuesday and charged in connection with a burglary that left the shop on Broadway with little of the equipment it needs to operate. James Philips, 42, of the 400 block of Viola Street in the city’s Waterfront South neighborhood, was apprehended at his home without incident around 6 p.m. by the Camden County Police, spokesperson Dan Keashen said. He was charged with two counts of second-degree theft and one count of third-degree burglary and was remanded to the Camden County Jail. Some of the silk-screening and other equipment, including electronics and tools, that were taken while Printworks was closed during the March 9 weekend was expected to be recovered, said Keashen. About $150,000 worth of equipment was taken. The suspect “was like a friend from the neighborhood, and hadn’t worked here in a while,” said Adam Woods, who has owned the proudly progressive, civic-minded and LGBTQ-friendly business at 1621 Broadway since 2006. Earlier Tuesday, two substantial orders of T-shirts were being screen-printed at Printworks for the first time since the burglary. Camden Printworks — its motto is “printing with a purpose” — was founded in the city in 1990. Peter Dear prepares silk screens (under yellow light) at work at Camden Printworks on March 19. 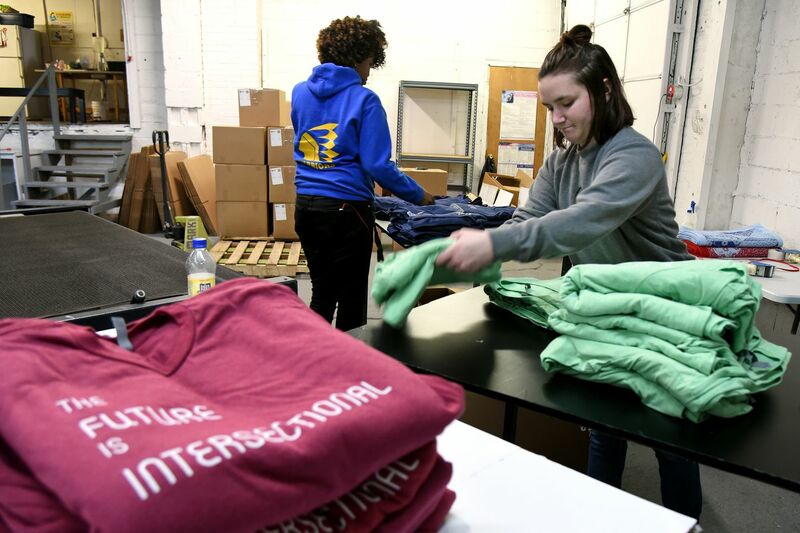 The company screen-prints hoodies and T-shirts for local and national customers, and has forged deep bonds with arts organizations and other nonprofits inside and outside Camden. It has printed more than 1,000 Black Lives Matter T-shirts; they are free for anyone who comes into the shop and asks. In a Facebook post, Laura Nicholas Sanchez of the Bridge of Peace Community Church in Camden’s Fairview section said, “We’ve had our T-shirts done by Camden Printworks for 20 years,” and urged others to pray for and order merchandise from the shop. The outpouring of support from the community and from other businesses has been a great boost. “We’re getting so much love,” said Howell. I’ll say: A GoFundMe account set up by friends of the business was more than $14,000 on its way toward a goal of $20,000 Tuesday. The company has between 8 and 12 employees, depending on the season, and often hires city residents, including people who live nearby in Waterfront South.